In 1999, I was working a few hours a week on a website that provided reviews of search engines. (Remember Ask Jeeves? Excite? Altavista?). The site was getting a modest amount of traffic but wasn’t making any money. I thought the site offered a much-needed service and wanted it to get more attention and to start turning a profit. I decided to send out a short email — essentially a PR piece about the latest reviews on the site. I was doing what anyone who wants to get good PR would do; I made a short list of online editors and started sending them regular PR pieces touting the latest search engine reviews on my site. What followed was beyond my wildest expectations. Within a couple of months, traffic soared from 20,000 visitors a month to over 100,000. I started getting requests for interviews almost weekly. Then one of the editors on my list contacted me about buying the site. I had discovered that I could get the press to do my marketing for me with incredible results — practically for free. Without spending a dime on advertising or an expensive copywriter, I got tens of thousands of dollars worth of free PR for my site. I don’t need to tell you that in 10 years the Internet has changed dramatically. You can still can have the same success with PR. though, and in this newsletter, I’m going to show you how. It’s all about blogs. Today blogs are the vehicle of choice for getting instant PR, and some entrepreneurs have leveraged them to create unparalleled success. Take my friend Steve Pavlina of stevepavlina.com. He started his blog on personal development in 2004. Two years later, he was earning over $1000 a day from his blog, and his earnings continue to grow. Steve spent $9 to register his domain and started writing helpful articles and posting them on his blog. He didn’t spend any money on marketing or promotion. Now he dominates the search engines in most personal development topics. In the old school model of PR, you write an article. You write your press release and then you send it around to your list of media contacts. And you hope a newspaper or magazine picks it up and runs it somewhere in their publication where people will find it. Using the new school model, you can use your blog to put your ideas directly in front of your readers yourself. That was Steve’s approach. I’ve done the same for MarketingForSuccess, thanks to my blog. Thanks to using my blog as my own personal PR machine, my site benefits from the top two listings in Google, right under the 3 sponsored listings. 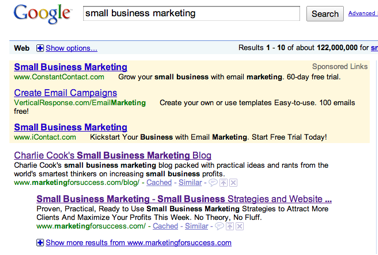 Want to know how you, too, can get free press and top rankings in Google? It’s easier than you think, and it begins by changing your focus. To attract more prospects, stop trying to sell your products and services and start giving prospects the information they want. Every product or service is designed to solve a problem. That’s the information your prospects are looking for; you’ll get their attention by giving out this information and you’ll keep their interest by engaging them in conversation. This is true no matter what products or services you sell. If you’ve been in business for at least a few years, or have experience that led you to open your business, you have a lot to say to prospects. A chimney sweep could blog about preventing chimney fires. If you sell jewelry, you could show off your knowledge of silver and semiprecious stones or your sense of style by blogging about trends. If you’re an accountant, tell your prospects how to avoid getting audited by the IRS. Write down the questions your prospects or clients ask you. Almost every one of these would be a good topic to blog about. Action: List at least 10 topics to write about that provide your prospects with helpful tips, ideas and knowledge. Still not sure what to write about? Write a piece on “How to Avoid Getting Ripped Off By [whatever a person in your field is called]! I’m always amazed at the number of clients I have who love the idea of leveraging a blog and articles to build business, but never write a word to get the process started. What’s the problem? Whether it’s writing an article a week or meeting with staff or spending the evening out with your spouse, if you don’t schedule it, it’s not going to happen. Every entrepreneur and small business owner runs into the same problem. We all have too much to do, and it’s easy to get distracted. Note exactly when you will, come hell or high water, write at least one article a week. What’s the number two reason most people never write their weekly blog post or article? You’ve set aside the time to write your article, but then an email pops up from an important client, or the phone rings, or a staff member sticks their head in your door with a question — if you allow these interruptions, you’ll be too distracted to finish the job. Short of an emergency, you want to be able to work without being disturbed. List below all the things you need to do to prevent interruptions. Now you’re ready to set up your blog. Yes, I’m going to get technical, but there’s nothing too daunting here. At least read through these steps so you know what to have your webmaster or virtual assistant do to set up and optimize your blog. Even if you plan on having someone else install your blog, read Step 4 on Optimizing Your Posts carefully. I’ve used other software but at this point recommend the free WordPress software as the best to set up your blog. If you’re technically savvy, you can set up a blog yourself. If not, spend a couple of hundred dollars to hire a webmaster. It should take two to four hours using one of the pre-formatted layouts. To install the theme you’ve chosen, download (and extract) the theme and then upload to the wp-content/themes folder. 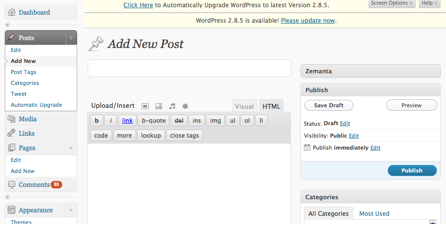 The new theme can now be activated from within your WordPress Control Panel. A web designer can modify an existing theme to match or complement coordinate your website deisgn, or develop a custom theme specific to your needs. Plugins are free or almost free WordPress add-ons which can be downloaded and installed to provide you with additional features for your blog. Below I’ve listed the features you should use to maximize the effectiveness of your blog and get your blog noticed by the search engines so you dominate your niche. Once installed, this plugin is almost totally hands-free. Click on the Akismet Spam Queue link in your WordPress dashboard a couple of times a month and delete the spam stored in there. To set up, click on settings, then All in One SEO. Complete the Description Titles with your blog name, keywords and description. Don’t change the default settings. Once you’ve set this up, you need not do anything further. It all happens automatically. To set it up initially, go to www.feedburner.com/ and create a feed. Then take the code it creates and paste it into the clearly marked space inside your WordPress Admin. and create a profile and a widget. Then come back to your WordPress control panel and paste the widget code into the ShareThis options page under the Settings tab. Once your blog is setup, using it just involves copying your article and pasting it into your online WordPress dashboard and completing the steps detailed below. Do these 7 simple steps each time you want to publish a post on your blog – these won’t take more than 10 minutes to complete. Make it keyword-rich. Longer is better. This makes it easier to read. 3. Include links to other relevant pages on your site. active in the search engines’ databases. This improves your search engine ranking by showing the search engines that instead of a bunch of individual posts, you’re building a collection of posts about related topics. relevant keywords to the post. enter a title for your post, a description and keywords. This and the article content is what the search engines use to rank your post. You’re done! Preview your post to make sure it looks the way you want it to and schedule the time you want your post to be published. A couple months ago I decided that I wanted to offer my audience even more content on my blog, and more breadth of marketing expertise. But no matter how well I planned my time, I didn’t have time to write more blog posts. So I created a short list of a dozen or so niche marketing topics, from advertising to web design. Then I had my staff go to work finding the top experts and writers for each niche area. Everyone benefits from this additional content; my readers have access to a body of expertise and my colleagues gain additional exposure. Traffic to my site has shot up, and my list and my sales are growing, too. You could do the same. Other bloggers and authors are good candidates for collaboration or exchanging articles and blog posts. Many are willing to write content you could use at no cost. Take the initiative to build your blog, to build your own personal PR machine practically for free. It’s the fastest way to get attention, build loyalty and grow your business.